I named the pattern that because they have bobble toes and thumbs. They are 9 inches from head to Bobble toe. finished doll on my facebook page, Amigurumi Freely, I'd love to see! The Troll's bodies were made with Cream and Off-White. 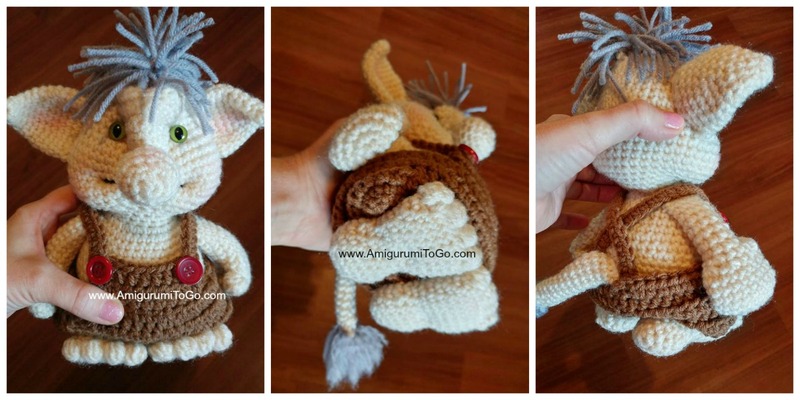 You can use a different brand of yarn and hook size, it will alter the finished size of the doll. Eyes: I used 15mm and 10mm safety eyes. You can use different sizes. You could also use buttons, felt, or anything else you desire for eyes. There is NO row count given for these. Instructions given in the pattern. Read me ~> How to read the rows: Each row has a sequence as given below. Example: 1sc then 2sc in next st means repeat that sequence 1sc then 2sc in next st followed by 1sc then 2sc in next st over and over to the end of that particular row (unless instructed otherwise). The number inside the parentheses ( ~ ) is the number of stitches you should have at the end of that particular row. *It would be too difficult to explain in written form some of the assembly and some of the things I've done to the faces of each doll. You do not need to watch every video but you will need to watch some of them. They will be linked in the written pattern with key times given. *The videos follow the same order as the written pattern. 22) skip ch, 1sc in each st for 1 or more rows. 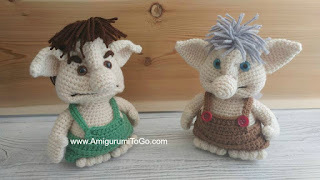 You can even add more rows later on as we begin to sew the troll together, it might be easier to add more then since you'll have a better idea how it will look then. . Starting at the top of the head working down to bottom of body: Cut a length of yarn before you start the head, about 12 or more inches long, and set it aside. Stop now and add the mouth. Please refer to part 4 of the video series, it's right at the beginning. Find the center of his face, that will be in between the big cheeks, push in the 17th row and then pinch it on the inside of the head. Sew that pinch together to hold it in place. Knot of yarn tails and cut them shorter. You can leave them inside the head. stop and stuff the head temporarily. Sew the nose on, refer to the video at about 6 minutes into part 4. After you sew the nose on then you remove the stuffing and add the eyes. Again, refer to the same video at about 10 minutes in. The row you put them on is up to you. Re-stuff the head once you get the eyes installed. stuff more into the head (if needed) before doing anymore rows. Pay attention to the cheeks, refer to part 5 of the video at about 6 minutes. Don't worry if you lose a bit of shape in the mouth, we will reshape that at the very end once the doll is all put together. stuff the majority of the body. Fill in any gaps in the neck area. You will stuff more after the next row. stuff more into the body. Shape all around the belly area, the belly should be nice and fat. 19) 1sc through both sides across the top of the arm closing it. Make sure you have left and right determined before you do the 2nd thumb. Insert yarn in between the 8th and 9th row. ch1 then in the same space make a cluster or a bobble stitch. Please note: the way I do these, for the thumbs and toes, are a bit different than the official "bobble" or "cluster" stitch. Refer to part 6 at 8 minutes for the thumbs. Yarn over before making a stitch like you would for a sc, then go through the stitch, grab the yarn and pull it through, now you have 3 loops on your hook, yarn over and pull through the first 2 loops, now you have 2 loops remaining. Leave those loops on your hook and repeat the same steps over. Repeat until you have 6 loops on your hook. Yarn over and pull through all 6 loops. 15) Make 4 bobble toes. See video here at about 6 minutes. for the 1st toe, ch1 then in the same space make a toe exactly the same way you made the thumb, then sl st the next st from behind the row. Ch1 and then in the next st over, make another toe. Repeat until you have 4 toes across. When done the last toe, f/o leaving a long tail for sewing up the foot. Stuff the foot, shape as you stuff. Sew the open edge of foot closed. Knot off and hide yarn tail inside foot. Do not stuff, sl st the st and f/o leaving a tail for sewing. Furry End of Tail: see tail video, about 7 minutes in. attach strands of acrylic yarn of desired color to the end of the tail, the stuffed end. I attached strands to 3 rows by pulling a strand of yarn through a stitch hole then knotting the yarn tails, you can do as you please with this part. Split all the strands then brush them until the strands are completely frizzed out and you're left with a furry tail. fold piece in half then 1sc through both sides across to connect the edges (ends) together. Just the two ends get sewn together, the top and bottom stay open. f/o and weave in yarn tail. f/o leaving a long tail to sew on one strap. Weave in starting yarn tail. f/o leaving a tail for sewing. Weave in the shorter yarn tail. I could not open assembly instructions. Is there a problem. Hello Sharon, thank you for this cuuuuute pattern. Was concerned for your health since it’s been a while! So happy you are back!! Thank you for the pattern!! I love your work. The assembly link above doesn't work though. What a great troll. Do you have a pattern for the goats, too. I want to make this set for our Kindergarten. I'm working on those next. They take some time to get them ready for publishing though.. Thanks so much for these amazing trolls! Is there a way to add beards too? I'm actually modifying a troll as we speak so I might be adding one. If it turns out I'll post an update on this blog..
Wow! I'm so happy to see new stuff from you <3 I can't wait to make him! That will be the next project on my hook! Did you say that your yarn is Aran weight? as i am using double knit and think my hook is too big, i might have to start again. no, I didn't say that. I said if you are in the UK, I believe the most similar weight would be Aran. Double knit would require a smaller hook. thank you Sharon, i started again with aran wool and 4mm hook, as i dont have a 4.25, things are looking ok so far. I'm not the most able crocheter in the world, but i find your patterns easy to follow, and the videos are just fabulous. i sent you a small donation as a thank you for this site, without which i would never have picked up a hook again since my childhood. I'm so glad! A 4mm is a great size for that yarn. It means a lot that you think my patterns and videos are easy to follow, that is like music to my ears. Thank you for the donation, it is much appreciated. I'm looking forward to your photo! you probably are using a lighter weight yarn than I did and you are using a much smaller hook. I've listed what I used in the supplies list, there you will also find a yarn chart that will tell you the difference in yarn weights. Nothing bad will happen but your troll will be smaller than mine.